I am a wife and mother to 3 wonderful kids and a furry little pooch named Mooch. I enjoy stamping and scrapbooking in my spare time. I often find myself in the basement stamping and scrapbooking where all my goodies are stashed. 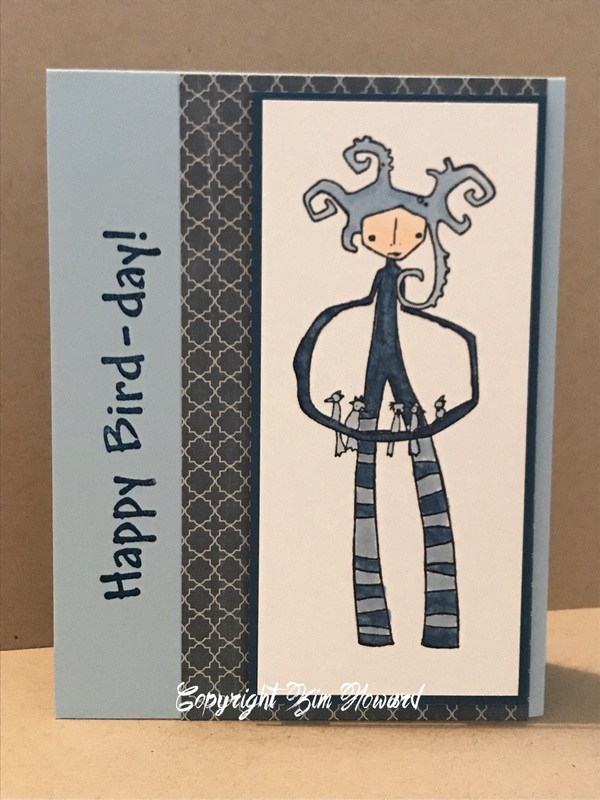 Ohhh, this week over at Stampotique Designer's Challenge we were given a difficult challenge for me-Anything BUT a card. I don't know why I always find that challenge a doozy, and this week was no exception. I had some ideas in mind but then I decided at the last minute to change it up. I always love to decorate things that I can display. I had some large wooden paperclips that I hadn't used and wanted something to display my new family photo. I grabbed a few of my all time favorite stamps and went to work. First, I created a background strip for the paperclip using the Honeycomb Background 8116. I stamped the Big Bee 3008 twice, once on white cardstock which I colored with my copic markers and then again on some vellum cardstock which I cut out to create some iridescent bee wings. I then stamped the Medium Bee 3000 and cut it out to adhere to the top as if he were flying right off my paperclip. There was a little open space so decided a sentiment of some kind was in order. Since there wasn't a ton of space, I created something using my Typewriter alpha 10018. Hope you have enjoyed my creations each week as much as I enjoyed being a guest designer for Stampotique Designer's Challenge. 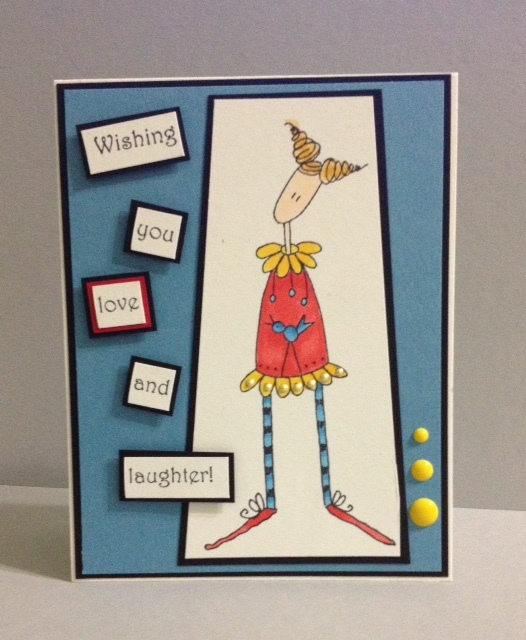 Jump on over and join us by thinking outside the box and creating Anything but a card. Anyone who has followed my blog knows I'm a fan of clean and simple cards. This week was crazy and I didn't find the time to be as creative as I would've liked to, but all in all I love the way this card turned out. Come join us this week at Stampotique Designer's Challenge for your chance to win a gift certificate. All you have to do is use all blue. For my card, I layered 3 different colors of blue for my base and stamped my Majestic Tree 10034 image in the same color as my base. I added the Wishing you love and laughter 8994 sentiment in a darker blue and embellished with a few pearls. Wow! Two weeks in a row I've gotten some stamping accomplished. Thank you to all of you that stopped by my blog or commented on Facebook, I appreciate the visits and missed my stamping friends! 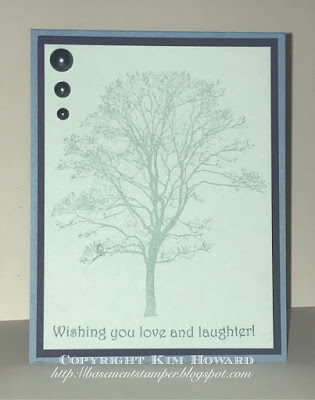 This week over at Stampotique Designer's Challenge we are going ALL BLUE. Create using only blue colors this week. For my card I pulled out one of my new stamps, Communitree 6225. If you haven't ever looked at the samples that go with the stamps, I encourage you to do so-those creating them have blown me away! I paired Communitree with the Happy Bird-day sentiment 8962. I have to say this was probably one of the easiest ones for me as I love the color blue and tend to use this frequently with my cards. Do you tend to use some of the same colors each time you create or do you go outside your comfort zone and spin the wheel of color sometimes? Hope you will join us this week and show us your creations! 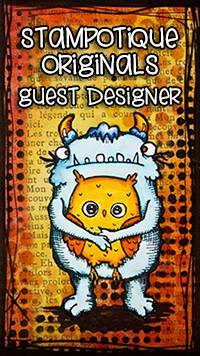 I'm so excited as this month I was asked to be Stampotique Originals Guest Designer. As most of my followers know I was heavily involved with Stampotique up until we decided to move and I took a new job and life got super busy. While I've always loved stamping and scrapbooking this found me packing things up and has been hard to get back into stamping at the level I was at...I do enjoy it though and this opportunity to join Stampotique this month has allowed me to break out my stamps/ink again. 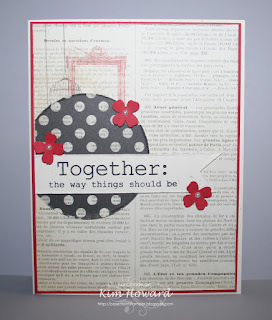 This week over at Stampotique Designer's Challenge it's Background Love. Create an awesome background. Stampotique has some amazing background stamps, but they have so many incredible stamps that you can create a background with as well. For my creation this week, I broke out Kate's Doodle Cube to create my background. 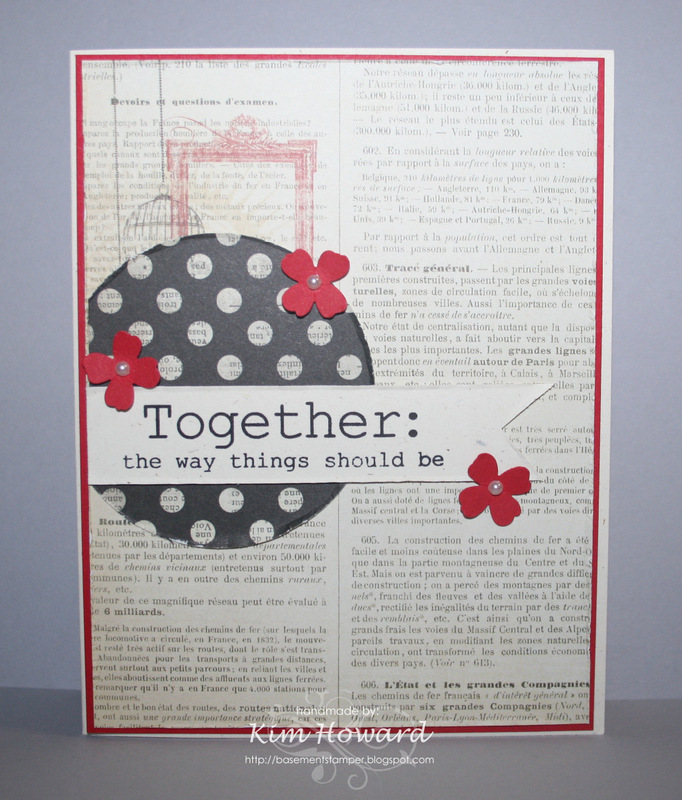 I then added in my sentiment with Alphabet Lower-I love this set and it's versatility. You could use it to create a background or a sentiment like I've done. Come join us at Stampotique Designer's Challenge for your chance to win some a gift certificate for goodies. I know, it has been a good year since I've blogged, can you believe it? I can't and I'm finally starting to get back into the swing of creating some cards. 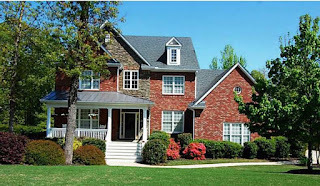 Last year shortly after my last post, we put our house of 15 years on the market in search of something a little larger for our family. It was not an easy process for us, as you can imagine, we collected 15 years worth of stuff and had 2 more kids than when we moved into the house. We got a storage unit, lots of cleaning and purging and my stamp stuff joined some other stuff at the storage unit to clear out my office. 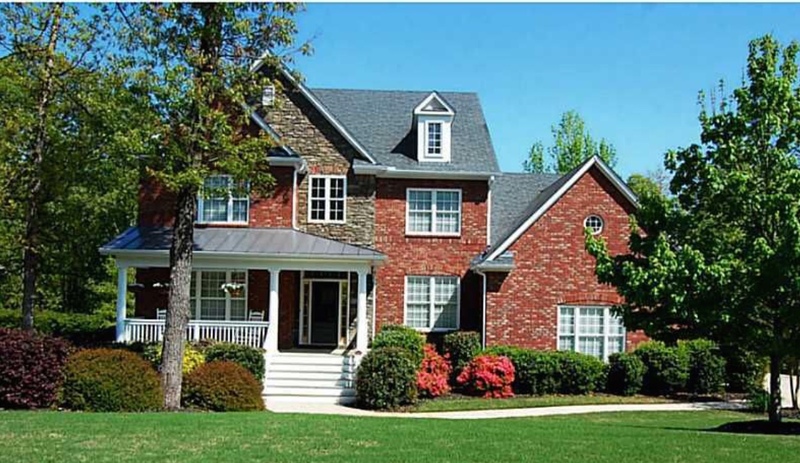 Fast forward to beginning of 2016 and we finally got an acceptable offer on our place. It happened very quickly and we were left scrambling to find a place to live. Thankfully our awesome realtor came through after looking at what seemed like a zillion houses and we closed and moved in the last week in February. Now, I will admit I have to do some more purging and definitely some more organizing but am slowly getting a few cards made here and there in my new area. Hoping to be more regular when I have the time and always enjoy the comments and seeing others work so thank you for sticking around if you are still following! The cards at the very top were some quick thank you's I put together after we had a little welcome to our house party. Hope you enjoy! You should have arrived from Nellie van Leeuwen's blog for our blog hop. I am joined by the Stampotique Design Team to showcase the images released from Stampotique this month. If you haven't had a chance to see what's new, you can do that over on the Stampotique website here. As with any of the releases, there is a variety of stamps from our artists for any stampers, scrapbookers and journalers out there. We always love to see what your favorites are so while you are hopping around, make sure to stop by and say "hi" on our blogs and come back here and tell us what some of your favorite images from this release were. We'll be giving away a $30 gift certificate for stamps and a grab bag of stamps on two of the blogs-but you won't know which ones they are so stop by and visit them all. We will pick the winners on our first challenge in September. I've been the design team coordinator with Stampotique shortly after I begged and begged to be a part of the design team. I've thoroughly enjoyed my time on the team, the great friends I've made, the way I've grown as a stamper, and mostly being a part of the Stampotique family. This is my last blog hop as I turn the reigns over to my wonderful design team member in taking over for me, Claudine Criner. Claudine will do a fabulous job and while I may not be as involved with Stampotique as I have been in previous years, I will always remain a faithful stalker. Thank you to all of you out there who always took time to leave comments or drop me a note-I always appreciated getting them. I especially want to say a HUGE thank you to our design teams through the years and all the support they have given me as their coordinator-there are so many extraordinary women out there on our team, and I'm so blessed to have been a part of this team and their lives. From here you will want to hop on over to Arwen McCullen's blog. 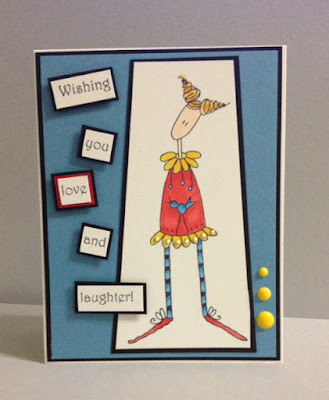 For my card, I'm wishing all of you love and lots of laughter! I'll be taking a hiatus from stamping for a bit while my family takes the leap of putting out house up for sale and finding a new (and improved) house that fits our family's needs. So, while I may not be posting my own creations-I'll still be checking all of yours out whenever I get the opportunity. I'm not finding as much time to stamp as I used to so I need to kick my mojo into gear one of these days. I made this card a few weeks ago but hadn't shared it yet. It's one that I really like how it turned out and finally am using one of the punches I had to have...now to figure out who to give the card to. Thanks for stopping by and visiting me and sorry I've been MIA. Original artwork © Kim Howard is shared for personal inspiration and enjoyment only. It may not be used for publication, submissions or contests without consent. If you like something created by me, please be kind and link it to me giving credit. Thanks so much for visiting my blog and hope you enjoy my creations!